Un contact ARISS planifié le 19 février 2016 à 14h23 UTC avec l’Oasis Academy Brightstowe au Royaume-Unis. Il sera opéré en direct par GB1OAB. Il sera audible au dessus de l’Europe sur 145,800 Mhz. La langue utilisée est l’anglais. Le contact sera retransmis en vidéo sur le site ARISS Principia. 1. Emily (12): From my research, I have found out that you are taking part in 265 experiments. Which one is the most important for us here on Earth? 2. Luke (15): In your opinion, will unmanned missions ever be equal to manned ones? 3. Francesca (16): In a microgravity environment, can dust, debris and liquids cause a danger, and if so how do you deal with it? 4. Seema (15): My aim is to be the first female Afghan astronaut. What would be the one most important piece of advice that you have for me? 5. Jack (11): Were you told what experiments you had to do, or did you get to choose? 6. Ashleigh (16): How many days supplies do you have on board should a resupply mission not would you potentially be able to live for, and how would you survive the longest? 7. Lewis (16): How did you build the confidence to go into space? 8. Natalie (16): Why should we continue to fund expensive space missions when we have more pressing problems on Earth? 10. Kerys (10): Did anything in your previous career or experiences, prepare you for space? 11. Jacob (9): Why did you want to become an astronaut? 12. Emily (12): When you push on the wall of the space station behind you to move forward, does the space station move backwards due to the principle of conservation of momentum? 13. Luke (15): What do you think of NASA’s planned one way Mars mission, and would you go if given the opportunity? 14. 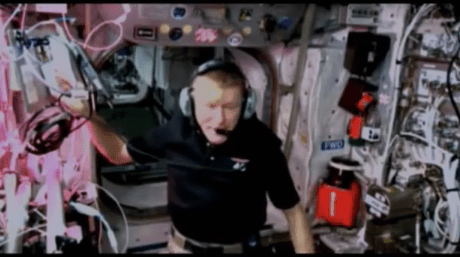 Francesca (16): Can you feel the ISS shake or wobble? 15. Seema (15): Being in a microgravity environment causes a decrease in muscle mass and bone density. Other than exercise, what measures are you taking to protect your health? 16. Jack (11): Considering that in space you are weightless and time has a different value, do you age at a different rate? 17. Kerys (10): Astronauts go through such lengthy and intensive training for their journeys. Was there anything that you were not prepared for? 18. Jacob (9): How are your experiments helping to save our Earth? 19. Natalie (16): What do you miss about being on earth? 20. Nazain (18): Other than the earth, can you tweet a picture of your favourite sight in space?